This Southwest Chicken Salad with Chipotle Ranch Dressing recipe is a sponsored conversation written by me on behalf of Tyson. The opinions and text are all mine. Salads are one of my favorite meals for busy school nights. Kaylee even loves taking leftover salad to school for lunch the next day. That girl loves her veggies! 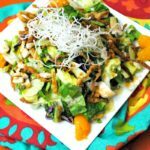 What really makes a good salad is a good salad dressing, like the chipotle ranch dressing I use on when we have southwest chicken salad for dinner. When I’m super busy, I will pick up pre-cooked chicken to make dinner prep a breeze. I recently picked up some Tyson® Grilled and Ready® Chicken Breast Strips to try out. They work really great in salads. They taste best if you heat them first, but you can also pull them right out of the bag and eat them because they’re fully cooked. Kaylee loves them cold coated in my chipotle ranch dressing. This meal makes a great weeknight dinner or weekend lunch. Even the kids enjoy it! The chipotle ranch dressing has a bit of spice to it. If you want it spicier, just double up on the chipotle peppers. You could also double up on the sour cream and omit the whipping cream if you want more of a dip recipe. Either way, it’s yummy with chicken! Looking for an easy meal to throw together at the end of a long day? Try this Southwest Chicken Salad with Chipotle Ranch Dressing. Place all ingredients in a blended and blend until smooth. Chop and prepare all of your southwest chicken salad ingredients. 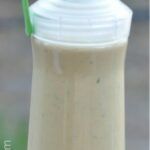 Drizzle chipotle ranch dressing over your salad. You can find the Tyson® Grilled and Ready® Chicken Breast Strips at Walmart. Be sure to save the Tyson Project A+™ labels to raise money for your school. Your school gets $0.24 for every label they submit! Read my post to learn more about the program. Have you tried Tyson® Grilled and Ready® Chicken Breast Strips yet?